The three legs/pillars of higher education are research, teaching, and extension. In the U.S. many public, tenure track faculty positions in science fields will directly list the proportional breakdown of expectations for these three academic pursuits. I have been anecdotally told more than once “you must excel in at least two of these pillars, however, one must be research”. Research is most highly regarded in the majority of large universities. It is an expectation in the sciences that a tenure track faculty member will successfully develop a globally recognizable research program. Teaching is also expected from nearly all faculty members, if not to a lesser extent than research. Because the act of teaching is an easily measurable metric, it can be tracked to ensure minimum requirements are being met. Unfortunately, the third pillar of extension, is the least revered pillar. Extension is the dissemination of scientific findings to relevant stakeholders within local, regional, national, and global communities. Because extension is one of the primary opportunities for the scientific community to outreach to the general public, it is an important opportunity for academics to communicate science. Since scientific publications are not accessible to the public, there has been a recent push for and growth of open-access scientific publications. Additionally, even when scientific publications are readily accessible, they are often incomprehensible to non-experts. Extension is an opportunity to directly interact with the public and allows for a strong professional relationship between academics and stakeholders. Recently extension services in some public universities has been replaced with a service requirement which are activities performed within academia not involving the general public. Academic service is often fulfilled by performing functions within university and can, if desired, be completely disparate from the role of extension. This transition to service is concerning and may lead to less communication between scientists and the general public. In the U.S., now more than ever, there is a general mistrust of the work being produced by institutions of higher education. Particularly in the field of natural sciences, representatives in the federal government have begun to reduce funding for scientific research. Because of these actions, the Ecological Society of America recently submitted a letter to the US congress warning that the passing of the America COMPETES Act of 2015, an act that would overall reduce the funding fields of natural science, would jeopardize the rigor and quality of research on important ecological and agronomic issues. Even with warnings from many other professional scientific societies, the America COMPETES act was passed. Therefore, there will be an even smaller pool of resources available for faculty to access to perform research. This distrust in science is at least partly to blame for the gap of scientific understanding between scientists and the general public. 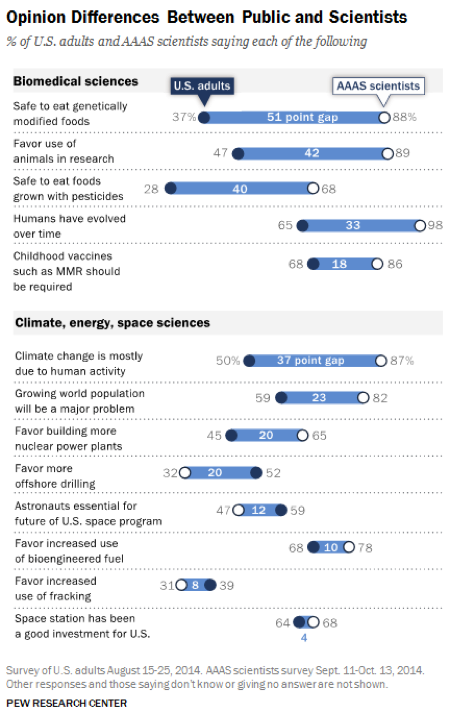 A survey by the PEW research center in 2015 showed the discrepancy between the percent of scientists and the general public that believe in key topics like genetically modified (GM) product safety, evolution, climate change, and pesticide safety ranged from 37 to 51% (Figure 1). By reducing the role of extension in institutions of higher education, we are reducing the relationship between the public and scientists which is resulting in more mistrust in scientific findings. Figure 1. 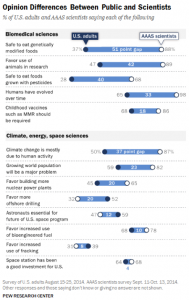 PEW Research survey on public perception of important scientific issues. In a system where research dollars are primarily sought through competitive grants, there is a clear linkage between the public’s perceptions of science, the support and funding offered for academic pursuits, and the extension services provided by academic institutions (Figure 2.). 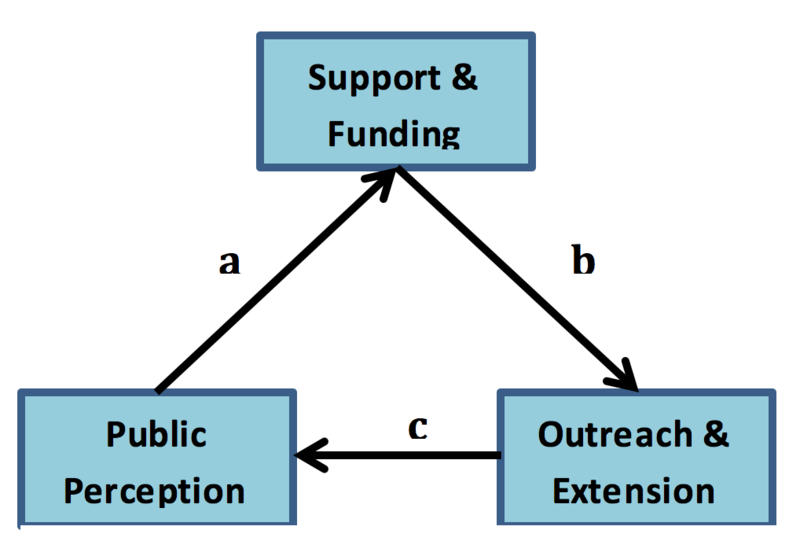 Public perception influences representatives at local, state, and federal levels which, I have shown, can directly impact the level of public funding offered for research (Figure 2 arrow a). Therefore, a portion of funding should always be directed towards extensions services to allow the education of the public on the importance that research makes to public well-being (Figure 2 arrow b). 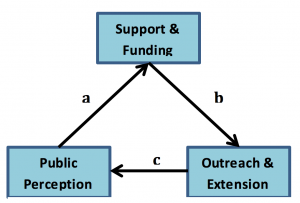 If successful, extension and outreach creates a positive perception of research within the public (Figure 2 arrow c). Unfortunately, as previously discussed our current support of extension services is lacking (Figure 2 arrow b). However, not all countries have the same perception of the role of institutions of higher education. Figure 2. The relationship between the public and academics within the competitive grant system. The role of academic institutions is not identical within the Swiss system when compared to the U.S. The oldest and largest institutions which are most analogous to U.S. public institutions, such as the University of Zurich (UZH) and the Swiss Federal Institution of Technology in Zurich (ETH), have very different perceptions of their role in the community. Trying to understand the mechanisms that professors use to communicate/extend science was difficult during direct interactions with faculty. In all cases, the idea of directly interacting with the pubic was not part of faculty focus. In fact, many professors pointed to educating the next generation as a role of extension, however, this would not fall under extension in the U.S. system. The best example of outreach to the community was an annual science fair at UZH visited by around 20,000 people. Although this is a form of extension, it is not comparable to having year-long professional relationships with stakeholders that extension often develops. This lack of extension could partly be explained by the ample internal sources of funding in the Swiss system that are not present in the U.S. system. Anecdotally, many researchers are given an annual research budget adequate to fund, at a minimum, a graduate student and all annual research costs. Additionally, grant acquisition is less competitive. One faculty member at ETH who has experience in both the U.S. and E.U. academic systems, reported that the funding rate of grants is at least twice as likely in the E.U. when compared to the U.S.. Another faculty member from ETH even suggested that there is a current push to “keep the metrics out of funding” and ensure all faculty have adequate funding. If resources are easy to obtain, then there may be less incentive to extend services to the general public to encourage support for funding. However, the development of applied sciences universities in the Swiss system is an alternative mechanism to extend research to stakeholders and the general public. These universities are funded directly through private industry by requiring a pre-established partnership with industry companies that are willing to supply half the cost of the research budget. This means research performed by applied schools is immediately applicable to private sector industry. University of Applied Sciences and Arts of Italian Switzerland (SUPSI) is one such university that has been established with the last 20 years. Even the mandate of this university, “Service, Technology, and Knowledge transfer to industry”, directly acknowledges the importance of extension and collaboration with stakeholders. 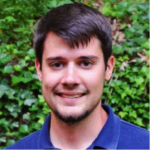 SUPSI develops solutions to applied questions of current industries such as industrial engineering, bio-remediation, and human computer interactions. Although these schools may fulfill the role of extension services, they are completely separate from the larger research institutions, and they do not hold the same prestige as the older, larger cantonal and federal universities. This is analogous to the lack of prestige held by many extension faculty in the U.S. system. Unfortunately, regardless of how extension services are performed, they tend to not have the same respect as is given to basic scientific pursuits. Communicating science is of the utmost importance to ensuring the relevance of research to social well-being. The United States has chosen to keep the responsibility of extension within the major public intuitions with unclear results. However, extension is perceived as ‘lesser’ than research in many institutions, and therefore the connection between the public and academics has weakened. Alternatively, the Swiss have created universities of applied science to fill the role of extension while still allowing basic researchers in large institutions to remain relatively distant from the public. Much like the U.S. system, Swiss applied schools have less prestige than Swiss research universities. Both systems are imperfect and struggle to connect science and the public. My hope is this issue will be recognized in the near future and steps will be taken to improve the public’s connection to science.